Rotageek allows you to easily manage both planned and unplanned absences on the Scheduler. 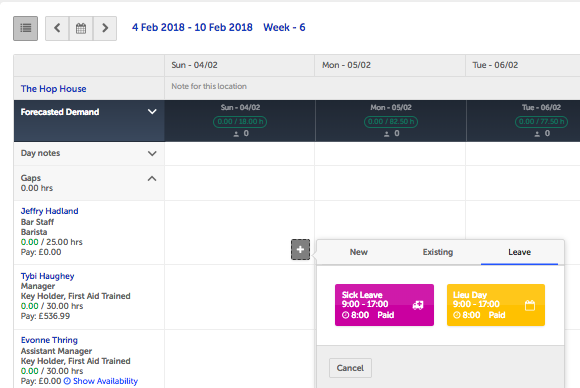 Annual Leave and other Requestable Leave types are scheduled using the Leave Admin tool and will appear automatically on the Scheduler once approved. To find out more about managing Leave in Rotageek please visit the Leave Feature Guides. Non-requestable leave types such as sickness, maternity & paternity leave, lieu days and study leave are managed in the Scheduler. When your company's account is set up, the Non-requestable leave types relevant to your business will be created ready for use on the Scheduler. To add Non-requestable leave on the Scheduler, hover your mouse over the day and individual you want to add it to. Click the grey plus sign which launches the shift creation dialogue box. Click the Leave tab, and select the leave type you require. 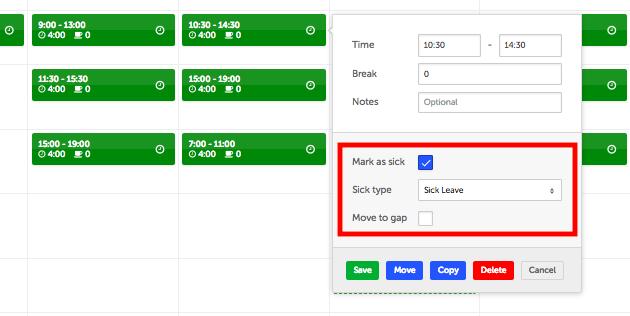 If you need to edit the leave information, such as the absence duration, click on the scheduled leave and type in the correct times. If you need to find cover for the shift, you can also tick Move to Gap, which will assign your shift to the Gaps row. To find out more about how to use Gaps to allocate unassigned shifts to available employees, check out our article on Using Gaps.